The first model, involves bringing the child into the parent’s or parents’ orbit. The parents bring the child along on their errands and outings. Example: Dad has Little Mary for the day. He takes her to Home Depot, The Guitar Center, to the car wash. He lets her punch in the four-digit security code when checking out items and paying with a debit card. Or maybe Mom brings Junior along on the grocery shopping trip, to the veterinarian’s office or the library to pick up some holds. She lets Junior scan the library books. The parent is involving the child in the parent’s routines, showing him or her how things are done in the grown up world. The second model is child-centric. The parent or parents are pulled into the child’s orbit. The day’s activities focus on the child. Example: Mom takes Little Mary to Little Mary’s favorite playground, takes Little Mary out to lunch at McDonald’s because the Happy Meal premium is a Little Pet Shop Toy or, takes Little Mary to the bookstore to buy the next title in the The Tiara Club series. Or maybe Dad attends all of Juniors football practices, teaches his son how to cast a perfect fly or, they build a bird house together. The parent sublimates his egocentric goals to the interest of the child. Go the F*ck to Sleep appeals strongly to the parent who holds to the first model, a person who is trying to fit parenthood into his/her schedule rather than the other way around. In an effort to watch a grown-up movie, the father (in the story) tries to get his child to bed and asleep. His frustration mounts and, profanity in storybook verse ensues. 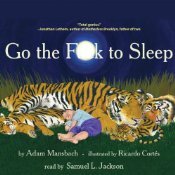 Other stuff: I dnloaded Go te F*ck to Sleep from audible.com. I receive no goods or services in exchange for reviewing this product, mentioning any of the persons or companies that may be named or implied in this post (including but not limited to the audiobook publisher, the vendor from which I purchased the audiobook, author, narrator and/or, the hosts of any challenges that this title may qualify for) or, the challenges for which this title may qualify.